Mary Jonas enjoys an evening on her stoop with granddaughter Emily (5, far left) and friend Emma (4). Emma and her sister used to rent the house next door to the Jonas’ with their mother but recently moved to Belpre. The two sisters, along with the Jonas’ grandchildren, often spend weekends with the Jonas'. The children enjoy the freedom and independence that the Jonas’ give them to explore around the farm and their ability to learn and be involved with the Jonas’ herd of over 50 boar goats. Emily gets help aiming her bow from mom, Sally Jonas, and grandfather, Mike Jonas. 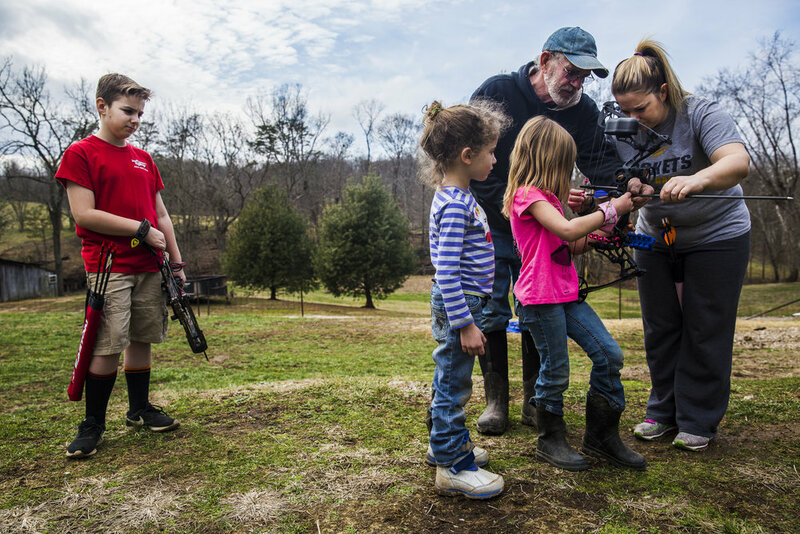 Bow hunting is a family affair in the Jonas family, and although not always used for hunting, the Jonas’ believe in the importance of imparting the skill of bow and arrows to the entire family. Mike Jonas pauses to pet one his boar goats while checking on his herd. All 45 of the goats in his herd are expecting babies in the spring. Emily plays with Grace, a preemie goat born about two weeks early. Emily spends some rare time inside her granparent's house. When she visits, Emily is encouraged to spend her weekends outside exploring Mike and Mary's farm of over 100 acres. Emily takes a break from playing with baby doll to inspect her sisters's bow and arrows. 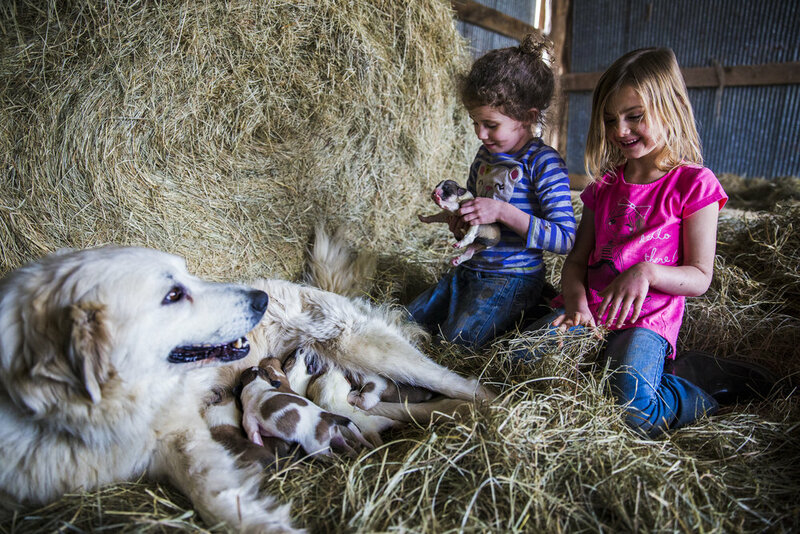 Emily and her friend Emma spend time with Heidi, a Great Pyrenees who gave birth to seven puppies three days before. Emily, although only five-years-old, has more independence than most children her age who aren’t growing up in a rural, southeastern Ohio town. Her grandparents believe in allowing kids more freedom while growing up so they develop life skills and knowledge of their land. Luke Jonas waits to shoot his bow while his mother and grandfather coach his sister Emily on how to hold her bow. Mary walks back with Emily after checking on her boar goat herd. The Jonas' except to increase their herd by over 80 new goats by the springtime.